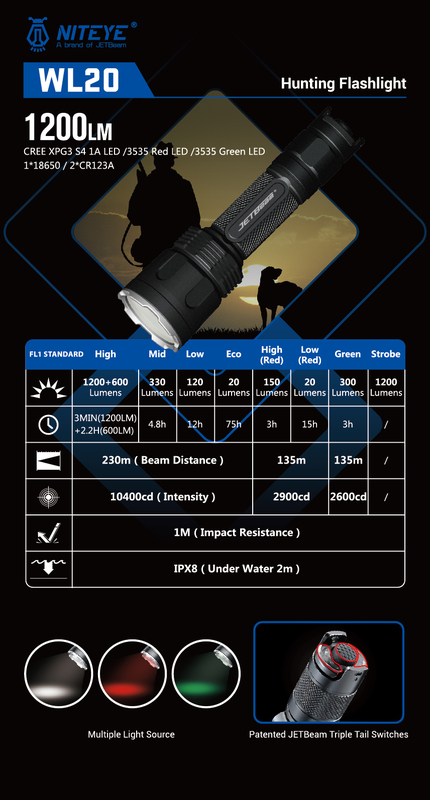 JETBeam'll issue WL20 Hunting flashlight with Multiple Light Source & Patented JETBeam Triple Tail Switches, News-JETBeam Electronic Technology Co.Ltd. JETBeam will issue the latest WL20 Hunting flashlight with Multiple Light Source and Patented JETBeam Triple Tail Switches for hunting and outdoor lovers . Newly equipped with a CREE XPG3 S4 1A LED, the WL20 produces a powerful 1200LM lumens of brightness. With this hunting kit, you get both red and green filters, so you can easily switch between the green light for hunting hogs, rabbits, and other varmints, to the red light for hunting coyotes, foxes, and other night predators. The included weapon mount and remote switch make hunting a breeze, easily attaching your light to the accessory rail of your rifle. WL20 Hunting Flashlight is Great for hunting and tactical purposes, this light is also useful during outdoor excursions such as camping, hiking, or caving - you'll want to take it with you everywhere!